BBC.com and The Wall Street Journal are among the first first premium publishers to use Smartology's new programmatic ad platform that uses 'semantic matching'. The new version of Smartology's SmartMatch uses semantic profiling to place each item of an advertiser’s branded content with relevant editorial articles on the same or closely-related topics. The creative served, in real-time, will be the one that is the best match for the article currently on screen. The new platform fulfils the role of the trading desk and demand side platform (DSP) and removes the need for a supply side platform (SSP), simplifying the programmatic ecosystem to increase transparency and reduce the tech tax burden. Publishers achieve the same premium CPMs as for direct sales, increase their yield for article page inventory and generate more overall revenue. Engagement rates for brands are significantly increased, enabling advertisers to make the most of their marketing budget. To ensure brand safety for clients, Smartology adopts a whitelist approach, only running campaigns for advertisers on selected premium publishers, while vetting each article page for suitability before bidding on an impression. Advertisers also have total control on where their ads are shown and are safeguarded against appearing alongside inappropriate content or publishers. 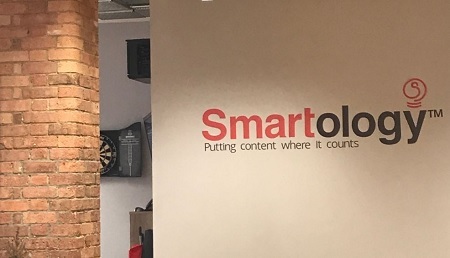 “Using Smartology’s unique platform, we can run highly-engaging campaigns that deliver return on investment and align with our editorial content – while ensuring the highest possible level of brand safety for our customers,” says Anna Foot, VP Advertising Sales EMEA, at The Wall Street Journal.